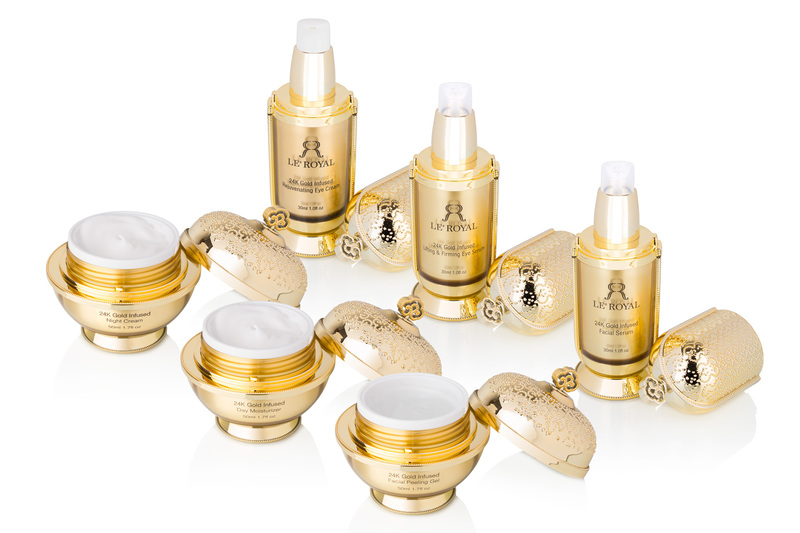 Gold is a color frequently associated with royalty and the color that Le Royal picked to showcase its high-end beauty line, which is infused with 24K. There are numerous creams and serums with the finest ingredients that make your skin feel pampered and rejuvenated. All of the expensive and innovative products are infused with some 24K, hence carrying the gold through to your skin. 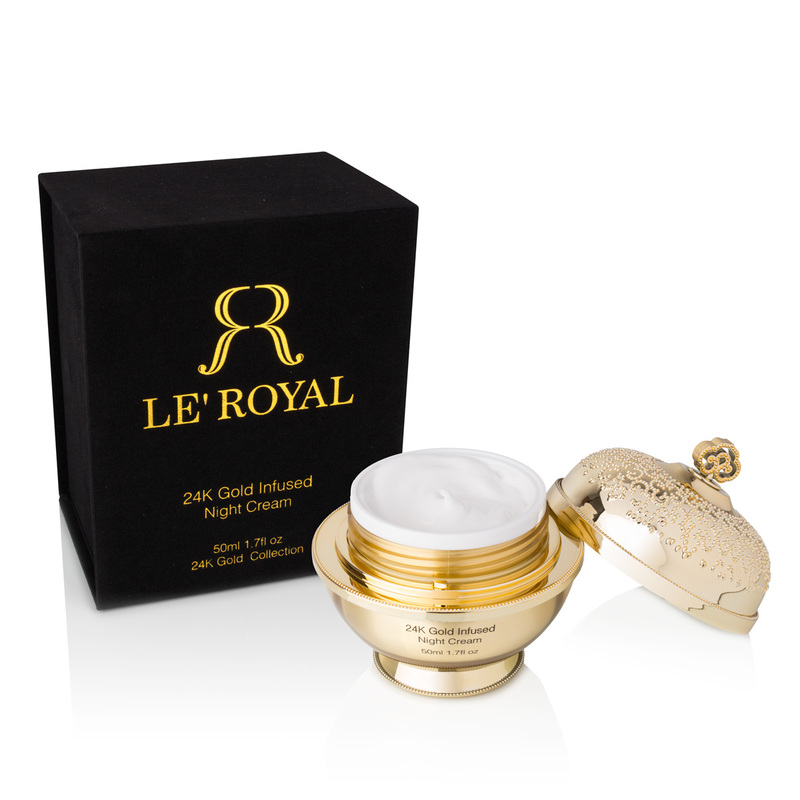 LE ROYAL LUXURY 24K GOLD INFUSED SKIN CARE IS THE LATEST INNOVATION IN THE INDUSTRY. Le Royal 24K products are currently available in some of the most expensive Chain Stores, Cosmetic Stores, Spa’s and Salons Worldwide. The power of precious metals and minerals has a tremendous influence on skin cells. Gold is well reputed for restoring the lost elasticity properties of the tissues, slowing down collagen depletion and the breakdown of elastin to prevent sagging skin. Reduce the appearance of fine lines and wrinkles with each treatment. The line is extensive including: 24K Eye Serum, 24K Eye Cream, 24K Facial Serum, 24K Day Moisturizer, 24 Night Cream and 24 K Facial Peeling Gel. What did I discover? I thoroughly enjoyed the product. I only experienced the 24K Night Cream and loved the way it soaked into my skin and after ten days, I did notice a difference. I indulged by using more than I need, as it felt wonderful. But, when the jar was half full, I started using it more sparingly, so it would last and it still had the same results. The jar lasted forty-five days and would have lasted longer if I had not been quite so self-indulgent in the beginning. Using the entire line would undoubtedly provide greater results, but it was out of my personal price range. The “Total Goddess Bundle” is approximately $2,100. For me personally, the 24K Gold Infused Night Cream was perfect. If you try this line out, we would enjoy hearing your comments.